In our Lenten journey of 40 days, we have reached the midpoint. This past Sunday was Midlent, Laetare Sunday. In the UK, it was Mothering Sunday: Mother’s Day. A simnel cake is what’s traditional there for the occasion. But in our house, we made pretzels. Homemade, from scratch, from simple ingredients. The pretzels were delicious, and they are the cover stars for your Convivio Book of Days Calendar for April. The calendar is a PDF document, printable on standard US Letter size paper, and a fine companion to the Convivio Book of Days blog. My family has been making pretzels each Lent for a couple of years now, for we enjoy projects like this, and, as luck would have it, the humble pretzel is the perfect Lenten food. At their most basic, pretzels are made with just three ingredients, all Lenten-friendly: flour, salt, and water. We add shortening, too, and ale to the water for boiling. What’s more, the classic pretzel shape of this centuries-old bread evokes the prayer posture of early Christians, who prayed with their arms crossed over their chest. Go ahead, try it right now, then look down at your chest: classic pretzel shape. In fact, the name “pretzel” is thought to be derived from the Latin bracellae: “little arms,” essentially. This penitential bread has a history that goes back perhaps to the 6th century. Some historians think pretzels may be even three centuries older yet. And so while Lent will still take up the better part of this month, take some time to make and enjoy some pretzels. It’s a fun and rewarding family project! At the end of this blog chapter you’ll find our recipe; plan ahead, for the dough needs to rest overnight in the refrigerator. Oh and please come see us this Sunday, April 7, at the Springtide Festival & Makers Marketplace at Florida Atlantic University in Boca Raton! We’ll be there with all of our springtime offerings from the Convivio Bookworks Catalog––all our new handmade paper egg containers and handmade chenille chicks from Germany, handmade pysanky from Poland and the Ukraine, our Sabbathday Lake Shaker herbs and teas, Royal River Pottery by Seth Thompson, and more. Besides us, there’ll be about 18 other makers and small boutiques, plus live music all day by Rio Peterson (Smiths and New Order covers!) and by the Lubben Brothers, (our great local band of bluegrass/folk triplets), games and crafts (learn how to use natural dyes to color eggs), and the most amazing doughnuts. The market starts at 10 AM and runs through to 4:30 PM. 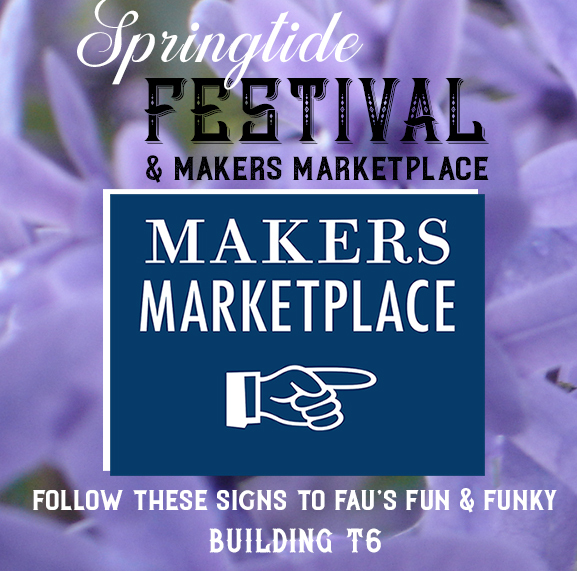 Free admission and free easy parking… just follow the blue and white MAKERS MARKETPLACE signs that will be posted on FAU campus roads that day. It’s the last market at FAU until the fall. My mom will be there, my sister will be there, and did I mention amazing doughnuts? Some people come to the markets just for the doughnuts. Seriously. Plus they’re just great fun. You should come, and if you do, please say hello to me. For updates, here’s the Facebook event page for the market. My suggestion for a perfect weekend for the locals? 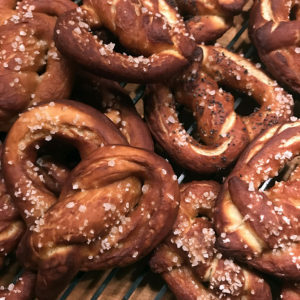 Make pretzels on Saturday, come to the Springtide Festival & Makers Marketplace on Sunday. Sure sounds good to me! Take note, this recipe is best begun the night before you intend to make the pretzels. First, add yeast and 1/2 cup brown sugar to a bowl, then add the warm water. Let yeast mixture get foamy (about 10 minutes). Next, mix the dough. Mix the flour and course salt in a bowl, then add the butter; mix until crumbly. Add yeast mixture and combine until the water is absorbed. Next, knead the dough on a board (or use a mixer with a dough hook attachment for this step, which makes things a lot easier). Once the dough is smooth and elastic, let it rise in a bowl (it will grow considerably, so use a large one). Wrap the bowl in plastic wrap and refrigerate overnight, or for at least 8 hours. When you’re ready to shape the pretzels, roll the dough out into a rectangle; it should be about 14 inches in one dimension and 12 inches in the other, which is important if you want pretzels that are uniform in size (and if you don’t care about uniformity, make them any size you wish, which is what we did on Sunday). Cut the dough into twelve 14″ strips. Roll each into a rope double in size (so, at least 28″ long), then form into whatever shape you like. For a classic pretzel shape, form each long rope into a U, twisting the two ends in the middle twice, then fold the twisted portion down and press the ends of the ropes into the circular part of the pretzel to seal. Set each pretzel on the baking board or on a baking sheet coated with cooking spray. Meanwhile, preheat the oven to 450º F. In a large pot, heat 8 cups water, ale (feel free to have a sip or two, so long as most of the ale ends up in the pot), baking soda, and remaining 1/4 cup brown sugar to a slow boil. Simmer pretzels, one at a time, for about 30 seconds, holding each below the surface with a slotted spoon, if necessary. This step is what gives the pretzels that delicious combination of crusty exterior and soft, chewiness inside. Transfer each simmered pretzel to a baking sheet coated with cooking spray. Sprinkle pretzels with salt, poppy seeds, caraway seeds, or some combination of toppings. Bake in the upper half of the oven for 5 minutes, then rotate baking sheet and bake 4 to 6 minutes longer, until the pretzels are dark brown. When done, cool on a wire rack… but these are best served warm, so let them cool for just a few minutes. You’ll get 12 large pretzels from this recipe. If that’s too many, the finished pretzels freeze really well. To enjoy them later, thaw and reheat in a 300º F oven until crisp.